The Impossible Frog Tongue is an innovative, reusable device that can be attached to all box-type Polaroid™ 600 and box-type Polaroid™ SX-70 cameras. It will automatically shield Impossible instant pictures from light as they're ejected from the camera. 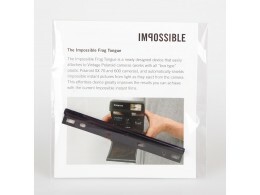 It greatly improves the results of Impossible films.